This is a story from one of our 40/40 Church Planters in Manta, Ecuador, Kellie Mendenhall. What this story calls our attention to is that God is a good Father and He cares about us so deeply that He will go any length to show us His love. Dear reader, He cares about you so much that He has treasures placed in your life all around you. Do you believe? I had been on vacation from for Christmas and New Years in Quito, Ecuador for the last week. My mom updated me that my Papa was sent to the hospital in the middle of the night December 31st, 2017. Needless to say, he and my Granny (along with some other family members) spent the first moments of the New Year in the hospital room. My mom called me January 1st, 2018 stating that she was in the San Diego airport awaiting a flight out — but couldn’t because of the fog. Finally, after a very long trip of waiting and taking routes that seemed a nuisance, my mom made it to the hospital near Portland, Oregon. Meanwhile, my Aunt Debbie was in the hospital because she lives closest to the hospital and my Aunt Cheri left her family vacation in Texas early to get to the hospital in Oregon to be with her Dad during this time. I had a video chat with my mom when she arrived, and during it she showed me to everyone in the room around my Papa’s bed. One January 2nd, I returned to Manta, Ecuador to get back to work. The very next day, we had a prayer service in the church. I got there a little late and so I had no opportunities to share with anyone about my vacation or what had been going on with my Papa. After the service, one of the youth, Maykel —15 years old and on his way to being a leader in the church, told me he had to talk to me. I hugged him, knowing the Lord shared that forme and to share with my family. I knew that He was talking to me about my Papa. I later told my mom. She was in awe. She wanted me to tell the rest of the family so I retold it to them who were in the room. Maykel didn’t tell me everything was going to be okay — God did. Maykel was just an instrument that God used to get my attention. Kellie shared later in an interview that her family had been praying for a word from God. 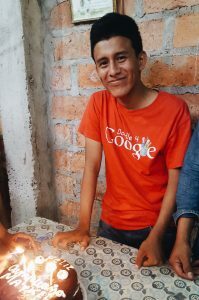 They certainly did not expect that word would come from a young man in Kellie’s church plant all the way in Ecuador. Maykel is an example to us to always be listening for God’s voice and to speak when He gives us a word of encouragement for another. What risks have you taken lately in obedience to God? How can you sharpen your hearing His voice?